“A picture is worth a thousand words”…. but only costs 20 pence! When 35 year Faustina, tested HIV positive a few years ago her dream of being able to provide for her daughter’s education seemed to slip away. However, with the help and mentoring of Gloria and Erneth, Mondo’s local co-ordinators, she was able to apply for a Mondo Business Loan and use the funds to rent out a small grocery store in her local village and purchase initial stock of drinks and snacks. Three years later, with a further three loans from Mondo she has been able to establish a successful business and with her last loan was able to buy a camera and a small machine that prints passport photos. 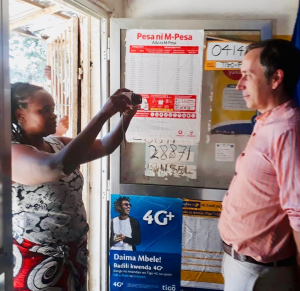 This has transformed her business and profits, as students from schools nearby all now require passport photos and Faustina’s shop is the only local shop providing this service. This last year alone Mondo has awarded grants to a further 86 HIV+ Women and we have just started awarding larger loans of up to £800, to women who employ three or more staff. If we can attract more funding this year we aim to increase these larger loans which as well as transforming the lives of the women, are beginning to provide a boost to the local economy, providing employment and developing local people’s skills. While Anna and Andrew were in Tanzania they were able to recruit a brand new Country Manager to help further develop this successful grants and loans programme. Watch this space for more news…. Last month over 140 previous volunteers and new friends joined us at St Michael’s Church Chester Square, London, for an evening of exceptional music, food and drink and to celebrate Mondo’s 15th anniversary. Called Music for Mondo the event was superbly curated by long-term Mondo supporter Sian Coombs who persuaded a wonderul collection of professional musicians to join her. They flew in from Italy and Ireland to perform for free and the concert included unique original compositions with musicians playing the piano, tabla, harp,and violin. The eveninng raised over £3,000 for Mondo’s work. During the evening we showed a short film focusing on the work Mondo has undertaken in Nepal and we calculated that over the last 15 years we have raised over £2.5 million to build over 30 schools (13 since the earthquake of 2015), fund teachers, establish a scholarship programme for students and send over 250 volunteers to the country. One of the guests commented afterwards, “I never knew Mondo did so much!”. Click below to watch a short film of the evening with music from Strauss, Debussy, Paganini and Ravel. Over the last few years Mondo has provided 30 computers for the schools in supports in Kalimpong and Darjeeling in NE India. 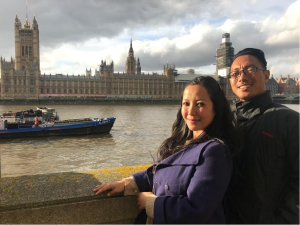 However in responding to the needs from the schools for more hands-on training we were delighted to be able to bring to London a wonderful couple from Kalimpong – Moa his wife Chandana. Until recently Moa has worked in the IT industry in Bangalore, India and Chandana is an experienced early years teacher. 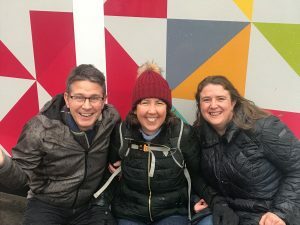 Through the generosity of an individual donor we were able to pay for their travel to London to join us for the Music for Mondo event and plan ways in which they can work with the Mondo schools to support the ICT training and provide support for quality early years teaching. As well as sending volunteers to India it’s vital that we also reciprocate and where possible bring future leaders to the UK to learn from them and co-design new programmes together. As well as working in schools Moa and Chandana have also set up their own cafe in Kalimpong and have valuable employability skills they are keen to share with school leavers. After 2 years as CEO, Stephen is leaving Mondo to take up a new position working with an organisation pioneering solutions for schools in the developing world. As Special Projects Lead he is off to Bhutan in April to begin working with a range of partners (including UNICEF) to establish Community Training centres and work with local teachers to support project-based and ‘maker’ learning initiatives. From 1 April, Anna Brian, who was until recently Mondo’s Programmes Manager, will take over as CEO. As a trained teacher with many years’ experience of working in international development in Africa and Asia, Anna looks forward to continuing to build Mondo and support all our fantastic local staff. If you’ve got any questions or thoughts on our work, we’d love to hear from you!